We know that in both France and St. Domingue, slaves were treated with harsh brutality and transported in inhumane ways in order to boost the French economy. We also know that wealthy individuals often supported colonialism and refused to relinquish privileges in order to maintain control and power. We see these overlapping tendencies frequently throughout both of these revolutions even though they were so distant from each other. The dynamic for these groups is complicated because laws were constantly shifting, especially in St. Domingue. Both of these revolutions began with non-violent protests and other methods of dissent but lack of response lead to more and more violence. We know that during both of these revolutions some groups of people were passive and either afraid of emancipation or were even opposed to it. Interestingly, the differences are evident and produced interesting outcomes. 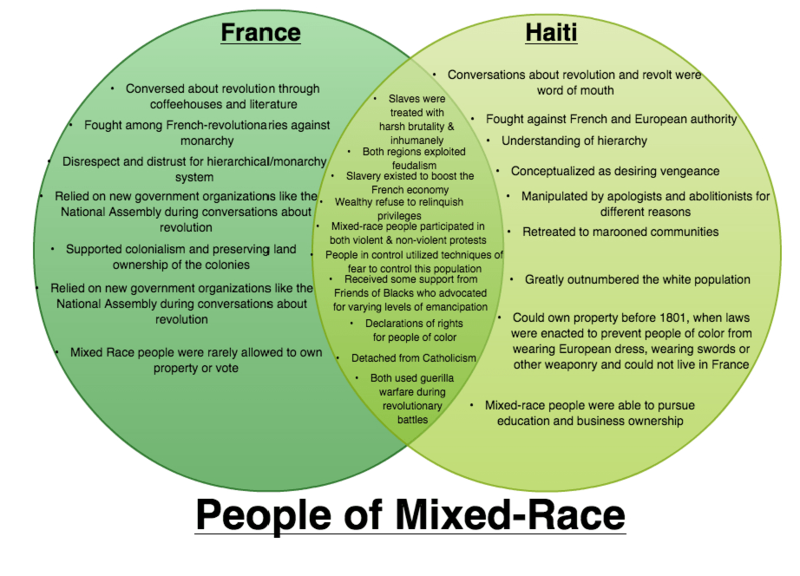 For instance, because the white-French population was so outnumbered in St. Domingue there was a constant paranoia and distrust, which resulted in the shift from a once nearly cooperative colony to a colony in upheaval. Because of that constant paranoia experienced by the white-French, conversations about revolt and freedom were forced into secrecy, a stark difference for the French revolutionaries who openly discussed this in public forums. Additionally, people in control in both of these regions manipulated people into submission through tactics of violence, diminishing existing rights and outright threats. Many citizens in both France and St. Domingue were obliged to live under a system of feudalism before, and the governments reaped the benefits. In both regions, emancipation was introduced and then repealed. These coinciding events may be a function of French attitudes, the introduction of civil rights and the absurd cruelty of slavery.